Appearing before a U.S. Senate subcommittee on Tuesday, Apple Chief Executive Tim Cook defended his company as a proud American business that pays more in taxes than any other U.S. corporation. 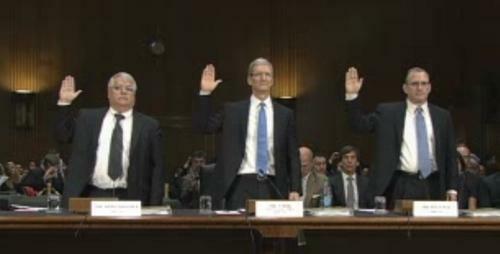 Cook's opening remarks touted Apple's pride in being an American-born company that has contributed billions of dollars to the U.S. economy. He noted that Apple paid $6 billion to the U.S. Treasury last year, and reiterated the fact that the company has directly or indirectly been responsible for the creation of 600,000 American jobs. "Apple has real operations in real places with Apple employees selling real products to real customers," Cook said. "We pay all of the taxes we owe  every single dollar. We not only comply with the laws, but we comply with the spirit of the laws." Cook, along with Apple Chief Financial Officer Peter Oppenheimer, was called before the U.S. Senate Permanent Subcommittee on Investigations, which is looking into loopholes in American tax laws. The subcommittee has chosen to focus on Apple, because of what officials have called a unique strategy of utilizing "ghost" corporations in Ireland to avoid U.S. corporate taxes. As part of its testimony, Apple has asked legislators to consider making sweeping changes to the U.S. tax code in its current form. The company has more than $100 billion in cash stored overseas  money that Apple executives have no current plans to repatriate because of the tax rates. "It would be very expensive to bring that cash back to the United States," Cook told the subcommittee. "Unfortunately, the tax code has not kept up with the digital age." The Apple CEO also made note of his company's plans to assemble an entire Mac line in the U.S. this year. Cook revealed to the subcommittee that those machines will be assembled in Texas, though he declined to name specifically which product will be made in America.